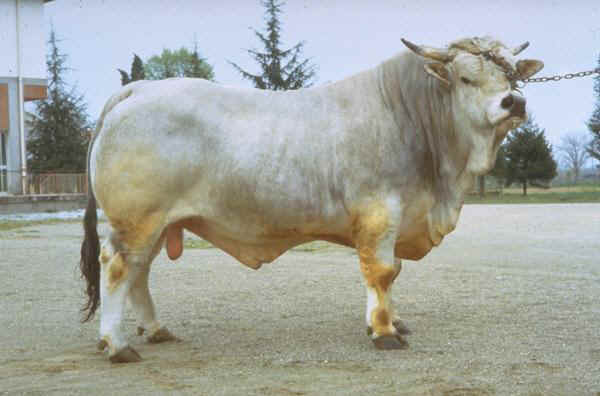 The origins of the Romagnola breed go very far back, deriving from the bos taurus macroceros (long-horned aurochs), cattle that originated in the steppes of Eastern and Central Europe and that gave rise to various breeds similar in constitution, type, coat and shape of the head and legs. During the fourth century AD, the barbarian hordes of the Goths, led by Aginulf, reached Europe with all their goods, including cattle. Part of these populations settled in the fertile lands of Romagna and their cattle were the ancestors of the Romagnola breed. Present throughout the modern day provinces of Forlì, Ravenna, Bologna, Ferrara and Pesaro, this breed has encountered a favorable environment with a wealth of fodder plants and a good climate. For centuries, this breed was used mainly in a dynamic capacity and cattle with well-developed forequarters, a solid structure and short sturdy legs were needed on that tough and tenacious terrain. Due to mechanization and the development of agricultural techniques, particularly during the second half of the eighteenth century, selection in this breed was aimed more towards beef production, a capacity that was gradually increased over time and became elective in today Romagnola cattle. The morphological and functional characteristics of breeds that have been specialized for beef production, together with a dynamic past that is a guarantee of strength, have brought the Romagnola to the attention of foreign breeders. Starting in the Seventies, the breed has been introduced in a number of countries abroad such as Great Britain, Ireland, Canada, the United States, New Zealand, Australia, Argentina, South Africa and Mexico. The National Association of Italian Beef-Cattle Breeders (ANABIC - www.anabic.it) was estabilished to promote and implement all types of initiatives aimed towards improving, developing, ad spreading the autochthonous Italian cattle breeds: Marchigiana, Chianina, Romagnola, Maremmana and Podolica. ANABIC, which came about by merging the previously existing individual National Breed Associations, has taken on their responsibilities as far as selection is concerned and has set up a single National Herd Book for the Italian beef-cattle breeds. The Romagnola is raised in the provinces of Forlì, Bologna and Ravenna and 15.000 heads are involved in selection activities. The Romagnola ha a white coat with gray shading towards the front and black apical pigmentation. It demonstrates significant somatic development and a harmonious structure that tends to be brachymorphic. The trunk is particularly well-developed in the transverse diameters, with particular emphasis in the hindquarters, where the thighs and buttocks reveal a broad, convex and markedly inclined musculature. This breed's short sturdy legs and strong feet have made it an ideal grazing animal. Beef-cattle type characterized by notable somatic development and a harmonious structure, with evident hindquarters and transverse diameter; lively, alert and docile. The balance achieved between beef traits and breeding traits, together with extreme hardiness under harsh environmental conditions and the proven quality of its nutritionally superior beef have placed the Romagnola breed among the finest beef cattle breeds in the world. Calving takes place without any difficulty and the cows give birth to wheat-colored calves that weigh an average of 40-45 kg. The Romagnola has an outstanding growth capacity that is comparable to the Chianina and Marchigiana. The cows weigh between 600 and 900 kg, whereas adult males reach 1200-1500 kg. They are slaughtered when they reach a weight of 650 - 700 kg, at the age of 16-18 months. Average slaughter yield is 62-63%.